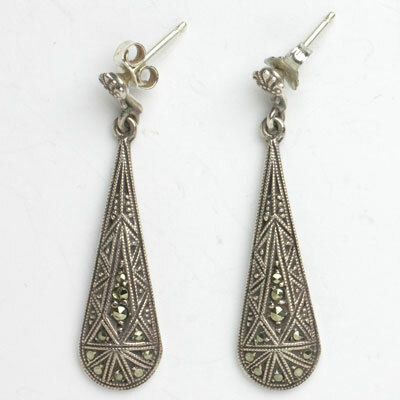 These delicate sterling and marcasite German Art Deco earrings were one of the first pieces I collected when I was fell in love with Art Deco jewelry from Germany. The detail on these earrings shows you why I felt that way. The original screw-backs were replaced with sterling silver posts for pierced ears a long time ago by my expert jeweler. 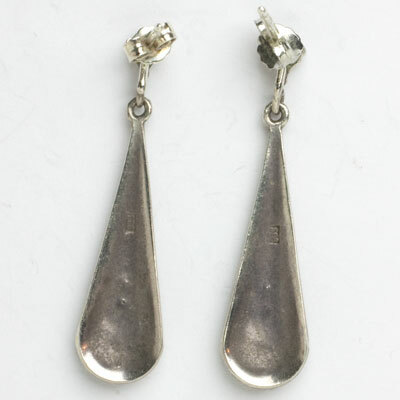 Notice that these earrings are marked 935, which is a slightly higher silver content than sterling (925). 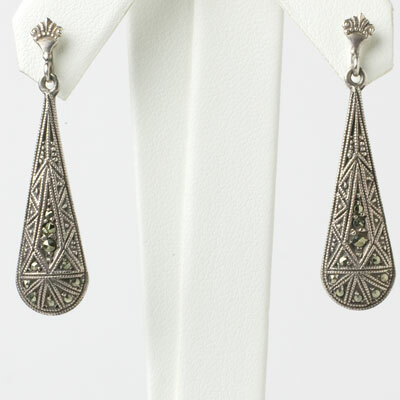 You could wear these earrings with any of my Art Deco sterling silver and marcasite pieces, with or without colored stones. Scroll down to see a selection. 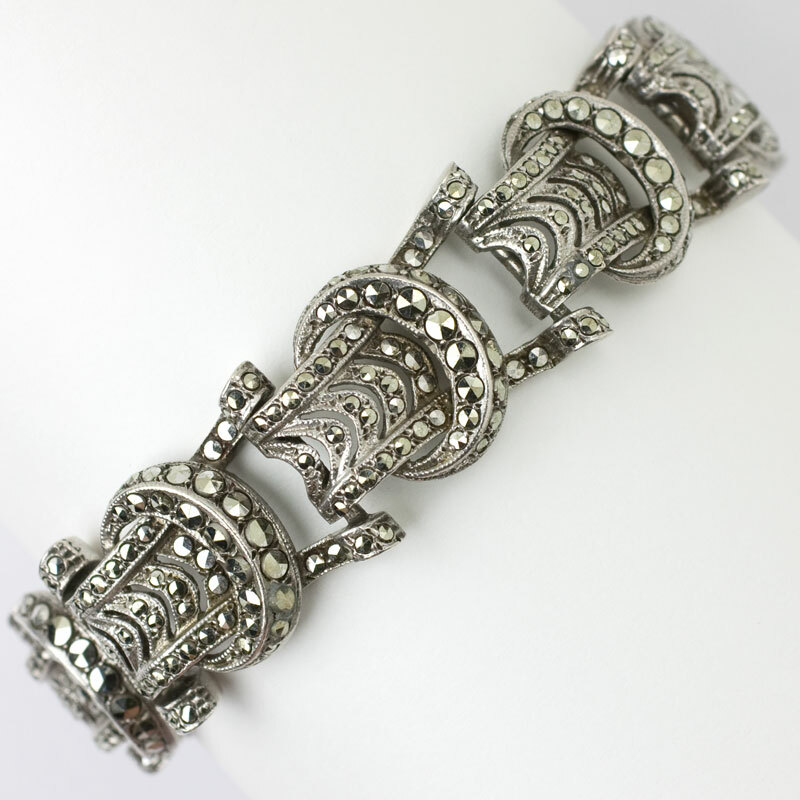 This Art Deco silver bracelet with marcasites is extraordinary! With its classic buckle motif, this magnificent and hard-to-find piece has excellent articulation and loads of sparkle. This substantial bracelet is an outstanding example of 1930s German craftsmanship and a real knockout! This jewel was part of my personal collection, and I am reluctantly offering it to a new owner. Scroll down to see the perfect pair of crystal and marcasite earrings to quietly compliment this piece — or wear it alone to make an unforgettable statement. 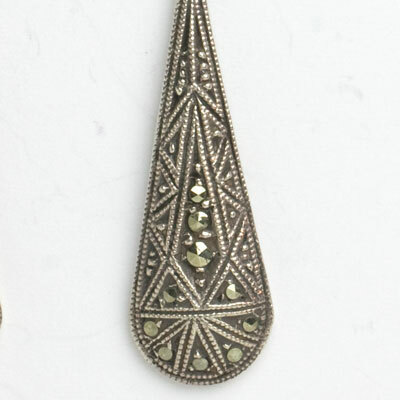 This Art Deco marcasite brooch has three faceted chrysoprase (glass?) stones set in sterling silver. It exhibits typical German construction and their aesthetic of the 1920s-1930s. The 935 mark refers to a higher silver content than the sterling standard, which is 925 parts per 1000 – not uncommon in German pieces of the era. 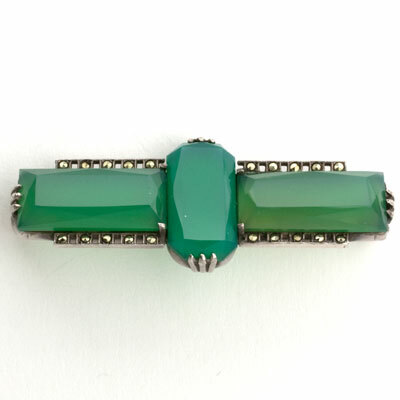 This brooch was in my personal collection and was among the first pieces I bought when I focused on Art Deco jewelry. You can wear this petite jewel at the throat of a blouse or on the collar of a jacket to great effect. Scroll down to see Art Deco chrysoprase earrings that look lovely with this piece. This green is lovely on women who look best in warm colors. 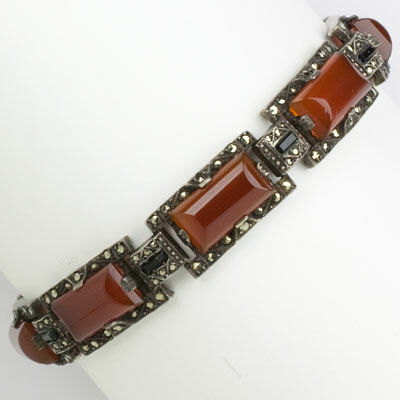 This marcasite bracelet has faceted carnelian and onyx glass stones set in sterling silver panels in an Art Deco design. This piece is an excellent example of high-quality German craftsmanship of the 1920s-1930s. Based on its width, I'm dating this bracelet to the 1920s, when bracelets were narrow and worn in multiples. This piece has a concealed clasp with a safety catch and was part of my personal collection. Scroll down to see a carnelian bracelet from the same era by Wachenheimer Bros.